In the aftermath of Hurricane Sandy, many East Coast home and business owners were left with a lot of flood damage and no idea how to go about fixing it. Whether you’re dealing with a weather-related flood or simply an overflowed household appliance, the team at Best Way Carpet and Tile Cleaning can help. 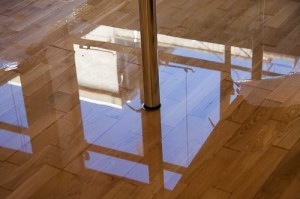 First and foremost, you’ll want to work to remove any and all of the water from your floors that you possibly can. Scrubbing your floors with a stiff broom can do this, as it also allows you to remove any dirt, mud or other material what might have gotten into your home. You will want to ensure that you clean with a detergent and disinfectant to reduce the chances of mild and mildew from forming. If you do find mold and mildew in your floor, don’t panic. While it may need to be replaced, you may also be able to remove any mold and mildew with your stiff broom and disinfectant. You will want to scrub any part of the wood where mold or mildew has formed with a stiff broom and bleach or other disinfectant. Don’t forget to rinse the area with clean water, so that bleach does not stain your wood further. When you are working to remove any leftover moisture, you’ll want use a careful process as to not cause any more problems. If possible, open your windows and doors to create airflow through your home and set up any available fans. You will not want to use heat to remove moisture, as this can damage wood more than it has already been damaged. While you have certainly worked hard to reduce the damage to your wood floors, a professional flood service company can help to ensure that your work is completed well. At Best Way Carpet and Tile Cleaning, our technicians are proud to offer emergency flood services that will get your home or business back in shape in no time. The technicians at Best Way Carpet and Tile Cleaning are here for you no matter how messy your floors may have gotten. To learn more about our services, don’t hesitate to give us a call at 732-391-6500 and visit us online at www.bestwaycleaning.net. This entry was posted on Friday, August 9th, 2013 at 10:13 am and is filed under Uncategorized.